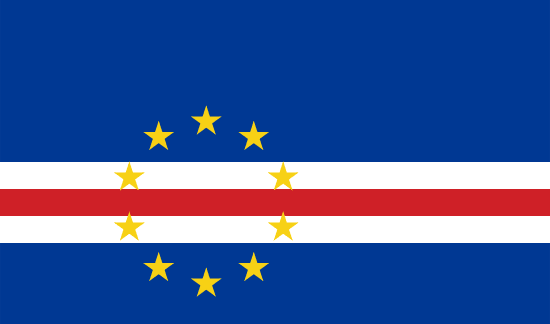 The flag of Cape Verde, which has been adopted in 1992, is composed of a blue sheet and three stripes in white and red colors. The flag also bears ten five-pointed stars arranged in a circle where the circle is centered toward the left side of the flag. The blue color represents the sea and the sky and two white and one red stripe should commemorate the country's development and the path towards progress. Ten stars represent ten islands of Cape Verde archipelago and the circle is to symbolize the unity of the nation. The islands lying near the west coast of Africa were settled by the Portuguese in the 19th century and in these times it was an important trade crossroad.